Vazhakkai Podimas recipe with step by step photos. This is a no onion , no garlic recipe which also happens to be vegan and gluten free. This classic tam-brahm recipe tastes best when served as a side dish with rice. Usually vazhakkai is cooked in every household on the Amavasya (New Moon) day, as a part of the lunch to give thidhi (offering) to the family members who passed away. The recipes prepared on that day are not supposed to have both onion and garlic as many fast (vrat) on that particular day and both these ingredients are not suitable for fasting. So vazhakkai is either made into a fry or as this vazhakkai podimas as it is made without onion and garlic making it a perfect vrat recipe. Recently when I went to my In-Laws place to celebrate Diwali, I returned with a big bunch of Vazhakkai. They were grown organically in the backyard without using any pesticides or chemicals and they were so yummy as well when cooked. 1. You can cook the plantain in an open vessel also but it will take a long time and needs constant supervision. 2. I used home grown organic plantain which was also tender, so cooked for just 1 whistle but if you are buying it from veggie shop then cook for 2 whistles as they tend to be a bit hard. 3. Do not overcook the plantain. It should be soft, cooked but still firm enough to either grate or crumble. 4. If you feel that the skin is being sticky, then grease your hands with oil while peeling and grating. 5. Instead of grating, you can also either crumble the cooked plantain or cut them into cubes. 6. If you do not wish to add lemon juice, you can always skip it. I made homemade vazhakkai chips as the boys love it very much and some finger licking Chettinad Vazhakkai Kurma and still have some left. 1. Pressure cook vazhakkai for 1 whistle. 2. Once it cools down, make a slit with a knife from top to bottom and open the the skin like you would open a book and peel away the skin of the vazhakkai. 3. Grate the parboiled vazhakkai using a big holed grater and keep it aside. 4. Heat a pan with oil. Add mustard seeds and once it splutter, add urad dal and roast till golden brown.Add broken whole dry red chilies, finely chopped green chilies and sauté for a few seconds. 5. Add grated vazhakkai, turmeric powder, salt, curry leaves & grated coconut.Mix well and close the pan with a lid and cook for 3-4 mins over low flame. 6. Take off fire.Add the lemon juice, once again mix well. 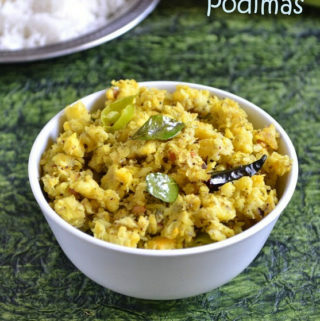 Serve this vazhakkai podimas with hot rice as an accompaniment. Raw Plantain steamed, crumbled & cooked with mild spices served as a side dish to rice. Vegan , Gluten free & no onion - no garlic recipe. Place whole vazhakkai with the skin in a pressure cooker. Add 1/2 cup water and pressure cook for 1 whistle. It would be parboiled by now. Once it cools down, make a slit with a knife from top to bottom and open the the skin like you would open a book and peel away the skin of the vazhakkai. Grate the parboiled vazhakkai using a big holed grater and keep it aside. Heat a pan with oil. Add mustard seeds and once it splutter, add urad dal and roast till golden brown. Add broken whole dry red chilies, finely chopped green chilies and sauté for a few seconds. Add grated vazhakkai, turmeric powder, salt, curry leaves & grated coconut. Mix well and close the pan with a lid and cook for 3-4 mins over low flame. Take off fire. Serve this vazhakkai podimas with hot rice as an accompaniment. the base paper is awesome, just now amma said, she prepare thokayal using the banana skin… So hopefully i will try those in monday and post it ! delicious and healthy!! I just love raw banana recipes!! This looks really good – I’ve never cooked with plantains, but I’ve always wanted too! I think I’ll try it! Wow, this recipe is very tasty and healthy! !